A few pages before finishing Chelsea Handler’s latest book, I pulled up an interview about her own reading habits. Like most successful comedians, she comes with a pronounced somber side. When I asked someone who worked for Chris Rock’s wife whether Chris had her doubled over with laughter during their run-ins, she said he was very serious and always reading. The opening inquiry in this Handler interview got to the bottom of which books currently sat on her nightstand. She listed five titles, four of which sounded pretty meaty. 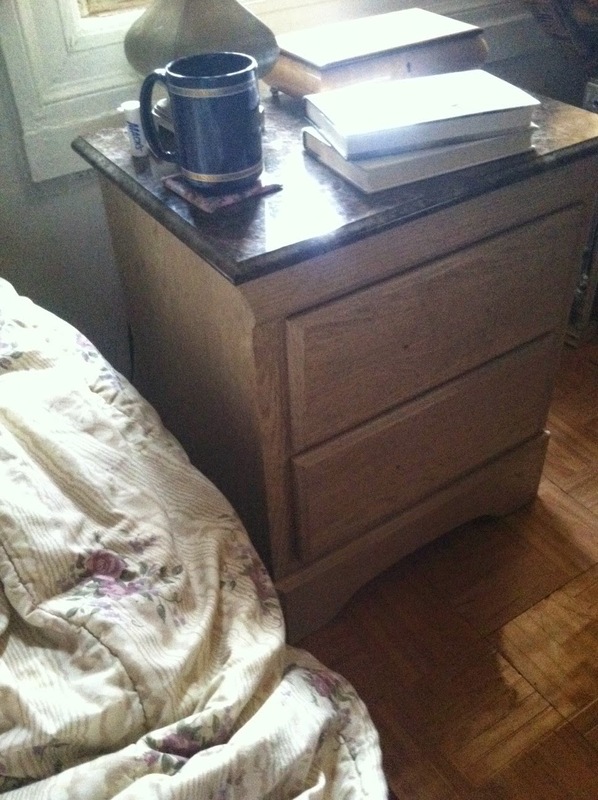 That’s quite a nightstand, I might have thought, with harmless envy, until mid-last week. Because until then, I never owned a real nightstand. While lying in bed, I stacked my phone, pens, papers, and refreshing beverages on any sturdy and available nearby surface, which occasionally included the floor. After finally committing to a nightstand I liked enough to buy, an unmarked truck delivered it last Wednesday. Whenever a friend or relative brings a baby into the world, the first few times I visit them all, I notice the parents staring at their infants with specific, uncontainable, beams of awe. That’s how I’ve caught myself eyeballing this nightstand (we haven’t been together a full week; I still wake to the faint aroma of fresh wood). Sometimes you don’t realize what you’ve missed out on until you’re no longer missing out. I’m overwhelmed, not used to this much bedside table space, on which I can stack books, and everything else, without having to worry about them falling off, or someone tripping over them, and hurting themselves. Excellent night stand! May you have many happy years together. Glad you've taken to putting photos into your blog. Lots of fun. That looks like my night stand only yours is a lot neater. Mine has books, remotes and a coffee mug photos and I don't know what else. My books seem to migrate all over the house to. There's some in the living room, kitchen, basement, garage (car repairs) and in my car in case I get stopped by a train.